Meinen 2. neuen WoJ Stempel hab ich für ein Kärtchen vom aktuellen Sketch saturday Challenge eingeweiht. Hab mir auch die superniedlichen Füchse geleistet*g.
My 2nd new WoJ Stamp I used 1st time for a card for the actual Sketch Saturday Challenge. I also bought this supercute foxes*g.
Fabulous card Heide, I love the image (so much so I used thte same image for this sketch lol). 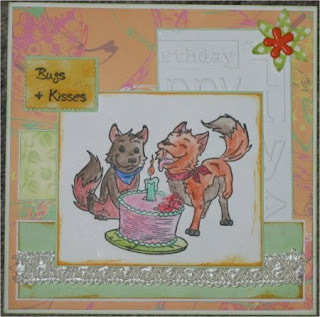 Great card Heidi!Love the cute image and the colours are beautiful. Oooooh lovely work! beautiful papers and such a fantastic image!